I've posted street style photos from the Emirates previously here and here. And this isn't the first time Marie Claire has featured women in hijab on their pages either; these two ladies were in the Dubai edition of 'What I Love About Me'. You can see the rest from the May 2009 issue here. I love Arshiya Quraishi's outfit in the first photo, and in particular her accessories. The pink brooch is a fab way of securing a hijab (very helpful in our windy weather! ), and tinted shades and a simple metal cuff add the finishing touches to a casually chic outfit. The brooch is a fantastic idea!! Beautiful shayla in the first pic; nice muted pink shades. 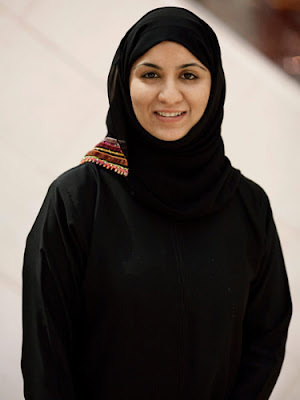 And yes you can find all sorts of abayas in the UAE. The more adorned ones are often 'evening' abayas. Many ladies are fashion-savvy, and have bespoke abayas that have a much better fit/cut than most of what's available online. The most lovely thing about this pics is: They have the hijab in a proper way!Bravo! We used to see woman on emirates with the hair showing out their hijabs! Bravo ladies! I must say i'm a black person always love the balck abayah! the first look is gr8.specially the pink brooch. wow!!.. i LOVEEE the outfit!, everything about it. Looks so amazing.! and the scarf is so pretty. That black outfit is VERY tasteful masha'Allah! The cuff is lovely, so simple and traditional looking. Though I wouldn't have picked the blouse for myself the sister is works it well. Mashallah! She looks lovely as dies pic 2. I actually cut picture one out of the magazine at work in order to copy her hijab style. Both are wonderful and just right for me!! Masha allah..i wish i could actually wear a full-on hijab like this where i work..but its not allowed(even in the good ole' USA)!! Alhamdulillah, this was featured in Marie Claire??!! wow, that is great..the more the people see hijab portrayed positively the more it will become accepted in the public square, and the easier it will be for Muslimahs who are following their din in dressing modestly. 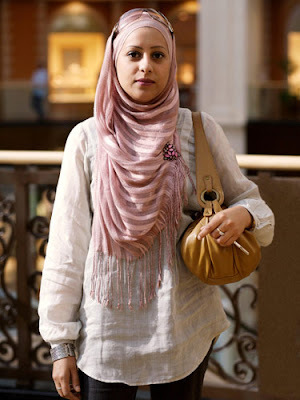 I wish I could find a square hijab with the same rose-pink stripes.